I listed one or two words from this phrase of the song. I continue to list one of two of the words from each of the phrases of the song, and type up the list in 42 font onto one page. 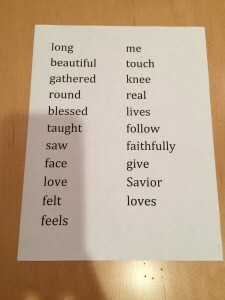 I print out 12 copies of the words (twelve because I want to divide into groups of three or four in my Primary, and I have 45 or so children). 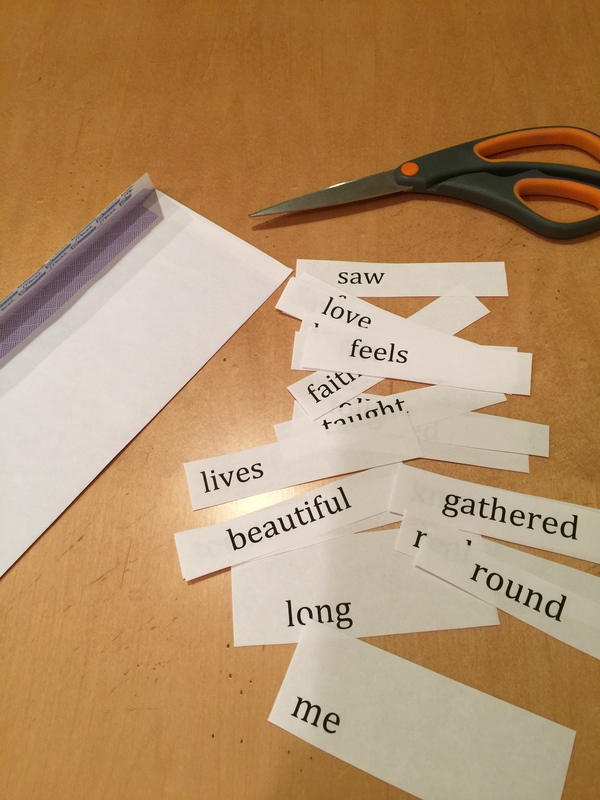 I take each page and cut the words apart, then put them into an envelope. I label the envelope with the name of the song, and continue until all the pages are cut apart and put into envelopes. I ask the children to find two or three friends and get into groups of three or four. I call out “Freeze!” and give them the rules of the “game.” 1. I will sing the song 6 times. 2. Put the words in the envelope in order before I sing the song through 6 times.. 3. Not all of the words are in the envelope – only some of the major words. “Ready? Go!” I begin to sing the song. Groups of children around the room are clustered around the words trying to get them in order as I sing the song. I finish the song and begin to sing it again. One of the older groups finishes putting their words in order triumphantly. I ask them to join me in singing to help all the other groups. Another group finishes and I ask them also to sing. We begin the song again. Yet a third group finishes and I ask them to sing. With the three groups singing the song for the others, I remain silent, but walk around the room giving help to the last groups. As an extender, when all the groups have finished, I ask the children to sing ONLY the words that are printed before them. We sing the song, singing all the rest of the words in our head (a very strong way to learn both the melody and the words). If there is time, we switch and sing only the words that are NOT printed in front of us. To finish, I ask that the children put the words carefully back in the envelope. Someone helps me collect the envelope while I move immediately on to another activity. Success. It was challenging for the children, it peaked their logic and word intelligences, as well as their music and people interaction intelligences. The children heard the whole song at least 6 times, yet they were focused on parts of the song. They were engaged and participating in a hands on way. Do you do both verses at the same time, or just one verse at a time? Dear Heidi, Because each verse has a different feel and meaning, I do a new activity for each verse. 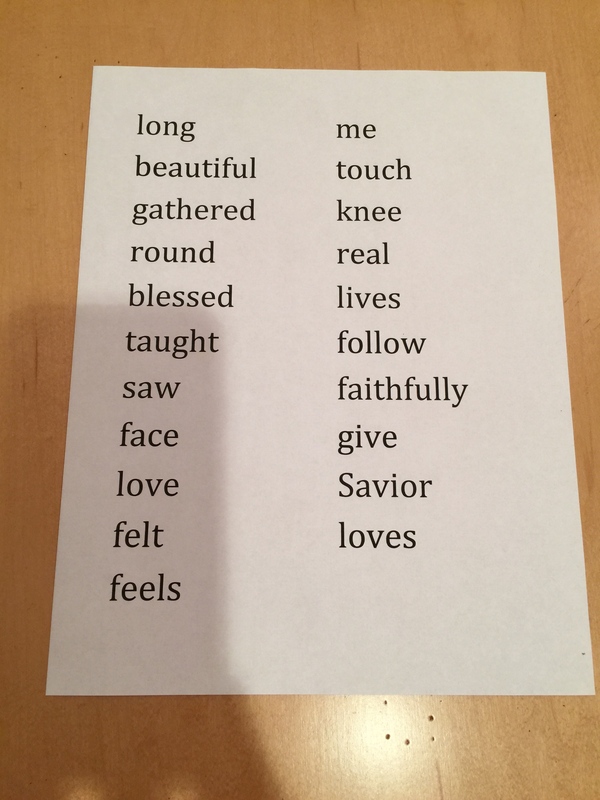 If your children know the first verse well, you could do the second verse with this activity. On this particular song, the rhythm changes for at least four notes, so hearing it over and over again, yet being totally engaged in something (Whole to part to Whole) is essential. Thanks for asking! I was unable to teach my SR’s in 3rd hour, so I prepped this for my sub. She said it was a hit! I start them on the second verse when they seem to have a good feel for the song. Sometimes that comes right away, and sometimes I need to continue doing different activities for just that verse. I always treat each verse as a “new” song with different activities. The verse will lodge in different pathways of the brain that way and not get mixed up. Thanks for asking. Thank you so much for sharing your ideas. I love how you focus on truly teaching instead of just entertaining. I used the sway and freeze with the junior primary last week and it was very effective. Where do they put the strips of paper together so they can see them in order? Just on their laps or on a chair? Just trying to work the logistics out in my head. Love your ideas! Thanks for taking the time to do a blog! Dear Cara, I usually have them put them on a chair or on the ground. Laps aren’t big enough and the whole group is working on it together. Thanks for asking! I did this today with our senior primary, and it was successful. They were engaged and heard the song several times. I became very discouraged, however, when it took a full five minutes to get them settled down and ready for the next instruction. They just seemed to tune me out. There were 53 of them in there today. What should I have done? I don’t like to stop every few minutes and demand absolute quiet because I feel it disrupts the flow, but am I creating a monster by trying to get them there naturally? Thanks so much! I’m ordering your book tomorrow and am so excited to gain from your knowledge and experience. I often use “Freeze!” before I give my instructions about how to end the activity (put the word strips back in the envelope and pass it in to the teacher). I then give them a time limit as I count down (10, 9, 8, 7, etc.). When I reach number 1, I will often give them a kinesthetic pattern to immediately grab their attention (clap, clap, stamp, stamp, snap, snap, etc.) saying “Here’s the pattern.” I will try to remember to write a post on transitions (a HUGE part of maintaining control in Primary). Please remind me if you don’t see it fairly soon. My senior primary loved this activity. We had enough time to do the two extender activities and they were a challenge! Thank you so much!